Titan Retail is a powerful retail management solution, developed in South Africa for both independent and franchise operations. Titan Retail allows retailers to maintain absolute control over all aspects of sales and inventory management, while presenting an easy and professional Point of Sale. Any POS can save you time, increase accuracy and control with what happens at the till point. But most POS systems involve high prices, complex setup and extensive training & consulting requirements. Titan Retail is the alternative that removes these barriers with an easy to use, accurate & affordable system. Titan Retail is designed for operation with both a keyboard and/or mouse or touch screen and can handle any type of independent retail or multi-branch environment. 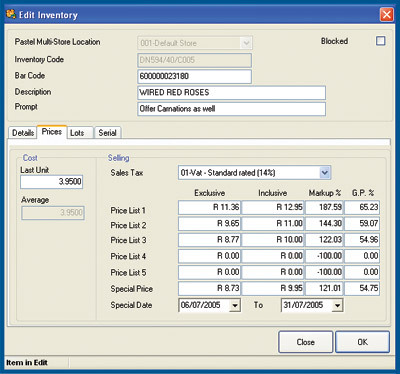 It includes special features for the retail industry such as sub category management, serial number and warranty tracking, detailed reporting, manufactured items, case lots and point of sale security control. Titan Retail will automate your till point and your accounting requirements, and it’s suitable for a single store or multiple retail outlets. 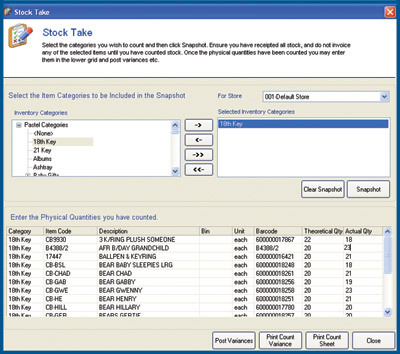 Now - stock control, POS, creditors and debtor management is available with one solution. Titan Retail POS solution integrates seamlessly and completely with Pastel Xpress & Pastel Partner. 100% INTEGRATION – into Pastel Partner & Pastel Express. EASY TO LEARN – staff do not require extensive training. EASY TO USE – requires minimum keystrokes and allows fast lookups. FLEXIBLE – handles any combination of discounts, returns, quotes, pro-forma, till payouts, suspended sales and specials in one easy application. TOUCH SCREEN READY – even faster processing with Touch Screen operation. DISCOUNTS – applies automatic discounts or preferred price levels to VIP customers. SECURE – blind cash-ups mean no more till shortages at shift change or day-end. 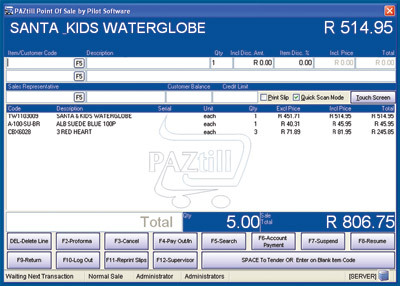 VERSATILE – prints invoices, quotes, cash receipt and payout forms. MODERN – works with all the modern retail devices including bar code scanners, pole displays, cash draws & receipt printers. REDUNDANCY – with OFF-line technology, lanes run independently and are not affected by network or server errors. MULTI-TENDER – tender a sale by any combination of cash, card, account and/or voucher. 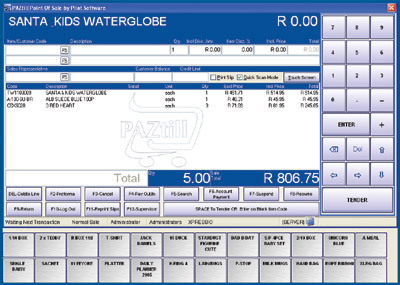 VARIED PRINTING OPTIONS - including customizable customer receipts, multiple printers and/or multiple copies. CUSTOMER LOYALTY MODULE - retain & reward your customers. DELIVERY MODULE - delivery of goods from a central warehouse or store, Picking Slips printed automatically at warehouse, delivery notes accompany goods. Create Customers at the Point of Sale, or at store level. LAYBYE MODULE - full Laybye management system, own-defined contracts, optional admin fee on cancelled Laybyes, extend a Laybye, receive early payments. Report on items reserved for Laybye. What are the benefits of investing in Titan Retail at store level? How long does it take to get Titan Retail up and running?